NO HOA! Beautiful, tranquil neighborhood, plenty of elbow room & storage inside and out! 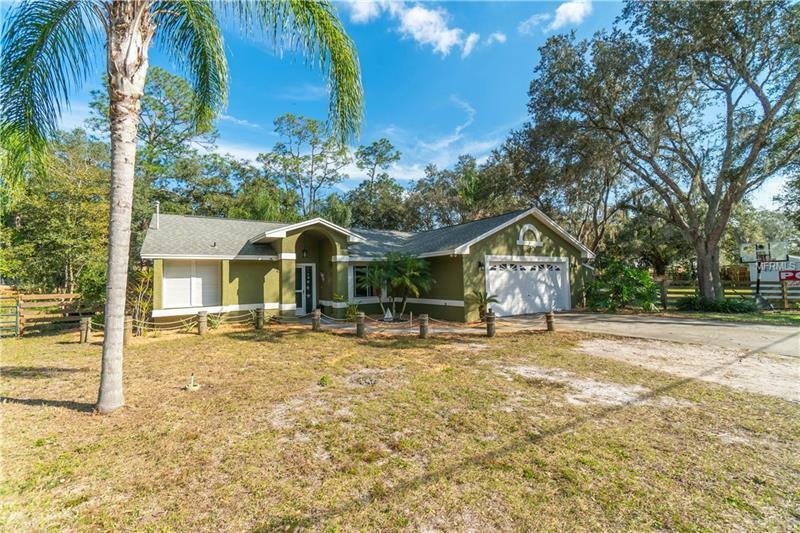 Awesome home located on a spacious 0.64 Acre fenced lot ONLY 300 FEET FROM TROUT LAKE AND 1/4 MILE FROM LAKE LIZZIE PRESERVE. Complete with a large 12 X 16 shed with electricity, water and shelving. Ample space in the yard for equipment, RV's and boat storage, or just room to run. Outdoor also includes a large fenced, 50 X 30, chicken coop, complete with chickens if you'd like, and a magnificent tree house, both with electricity and lighting. Coop also has water and ready made boards for hurricane protection. Home features beautiful wood cabinets, wood floors and a master bedroom walk-in closet. Double pane windows, water heater, garbage disposal and black stainless steel appliances all under 2 years old. Kitchen features a reverse osmosis filter at the sink and a dual oven. Whole house and shed are wired for internet, cable, and speakers. Living room is wired for surround sound. Garage is complete with built in cabinets with slider doors and shelving and peg board for tools. Enjoy daily walks through Lake Lizzie Preserve which features over 8 miles of hiking trails. Enjoy fabulous views and fun activities on Trout and the connecting lakes. These pristine lakes are part of the Alligator Chain of Lakes, seven lakes total, connected by navigable canals for hours of beautiful boating, fishing and skiing. Endless possibilities for tranquility and/or entertaining both inside and out. A must see. Come Home Today. Additional Water Information: Only 350 feet to Trout Lake and a boat ramp.